What are the signs that your community has been secretly selected for an infusion of refugees from Muslim nations like Syria or Somalia, or migrant workers from Central America? The Obama White House released a report last week on the integration of immigrants and refugees that provides some clues. It could be something as simple as a new billboard along the highway touting the contributions of diverse immigrant populations and refugees. Or maybe you’ll hear a radio spot or see a TV ad delivering the same type of message. Your local public library will start hosting “story times” that glorify the role of immigrants and the value of diversity in your community. Below is an example of the ads circulating in North Carolina sponsored by a group called Welcoming America, which was started in 2010 with seed money from billionaire George Soros and now works with the federal government to influence Americans’ attitudes toward immigration. WND also reported last week how the federal government withholds key information from the public in host communities until right before or after refugees arrive, and how one congressman, Trey Gowdy, R-S.C., is demanding answers to 17 questions about the program. Once the soil has been prepared, the seedlings will arrive. And the seedlings, according to those planning the changes for your city or town, need to be nurtured and cultivated into healthy communities of their own. They will eventually be fully “integrated,” meaning they are firmly established and able to grow within their host community, eventually overtaking the host. The report is chock full of programs, goals, plans and strategies to build welcoming “receiving communities” and give immigrants all they need to prosper economically, linguistically and politically. Critics argue the plan will do the exact opposite, weakening stable communities by delivering a steady dose of low-skilled immigrants who will place a burden on schools and social services. The new arrivals are likely to be seen working as hotel maids, toiling in meat-packing plants, as cashiers at big-box stores, dishwashers or other low-wage jobs that require food stamps, subsidized housing and other forms of government assistance. One way that could happen is through the withholding of various federal block grants for development projects for cities that don’t participate, while showering communities that do participate with new grant money. The White House plan calls for the marshaling of almost every federal agency to participate in creating welcoming communities. For “effective integration we need a comprehensive national and local effort that draws on the strengths and capacity of all sectors of society and all levels of government – a ‘whole of society’ approach,” the report states. Partners will include schools, libraries, corporations, universities, and community-based organizations, to name a few. In other words, an army of community organizers, bureaucrats and technocrats who will soon descend on local communities nationwide pushing for more welcoming environments for refugees and immigrants. The plan calls for using existing federal funding opportunities and putting pressure on Congress to create a new “revenue stream” that will fund a host of new integration programs. Obama created the Task Force on New Americans in November after he unilaterally granted amnesty to more than 5 million illegal aliens. The administration’s robust refugee resettlement program has been added to the mix with a focus on refugees from Somalia, Iraq, Syria, the Democratic Republic of Congo and other Muslim nations. Illinois, for example, uses mobile units to hold “service fairs” or “welcoming days.” These programs will “ensure that approximately 11,000 new Americans receive access to services,” the report says. The cities of Dayton, Ohio; Baltimore, Maryland; High Point, North Carolina; Chicago; New York City; Los Angeles and Boston were held up as examples for other cities to emulate in the way of welcoming and integrating new immigrants and refugees. Cities are also encouraged in the report to “celebrate World Refugee Day on June 20″ with film screenings, soccer tournaments and community dialogues. Steven Comarata, director of research for the Center for Immigration Studies, said these types of government overreaches should be expected when immigration levels are as high as they are today. “It seems almost inevitable with an immigration policy of open borders and the numbers that we’ve seen, both legal and illegal, coming into the country, to the point where one in 10 Americans are now recent immigrants,” he said. 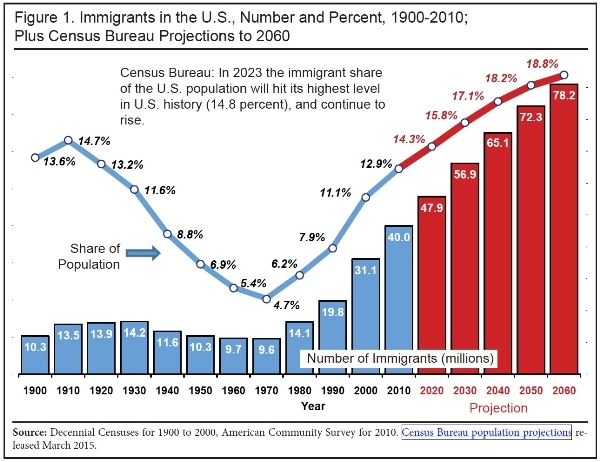 According to new Census projections, the U.S. immigrant population is on track to reach its highest percentage ever of the overall population in just eight years. Comarata’s organization, CIS, has been pushing Congress to reduce the numbers of immigrants entering the country, which would reduce the pressure on government to accommodate their needs. “Now you could say, ‘Hey, they can fend for themselves,’ but the reality is the presence of enormous numbers will create tremendous pressure for the government to do more,” he said. For example, he said 68 percent of the growth in the uninsured population comes from new immigrants and their children. “And what is one of the main arguments for Obamacare? It’s the growth in the uninsured. Studies show that immigrants themselves generally have a more positive view of government action than indigenous Americans, Comarata said. So these are not your great-grandmother’s type of immigrant, when loads of Italians, Germans and Irish came to the U.S. in the early 1900s with nothing and were forced to work hard and scrape their way to a middle-class lifestyle. Comarata also stresses that legal immigration is a much bigger piece of the overall immigration pie than illegal immigration, with 1.1 million legal immigrants entering the country each year. That compares to approximately 100,000 to 200,000 illegals. “And we’re having absolutely no debate at all on that,” he said. Reduce “barriers to citizenship,” such as making the citizenship test easier for elderly immigrants. Lower citizenship fees for some immigrants and allow others to pay by credit card. Make sure immigrants and refugees wanting to start small businesses have access to start-up capital. A New Americans Corps will be created through the existing AmeriCorps volunteer program and these armies of volunteers will work to “build capacity” in the movement to welcome and integrate New Americans into communities nationwide. Emphasize existing funding opportunities to assist new Americans. Increase opportunities for communities to use federal funding streams to develop and implement local integration plans. “Culturally and linguistically appropriate services” must be delivered to immigrants in health and health care and other areas of need.